Approaching home after my walk, beginning to wonder again about plans and decisions after clearing my mind, a great bird flew across my view from west to east. It was so large I took it at first for the heron, so long, wings spread so wide, tail like some darting dessert lizard. But then I saw a bit of curved beak in the profile of the head. A Golden Eagle perhaps. Since the head wasn’t noticeably white, it couldn’t be one of the Bald Eagles that perches in the big cottonwoods on either side of our fields. As I watched, it flew to one of these tall dark trees at the back of the garden. I walked into the orchard behind the house to get a better look. 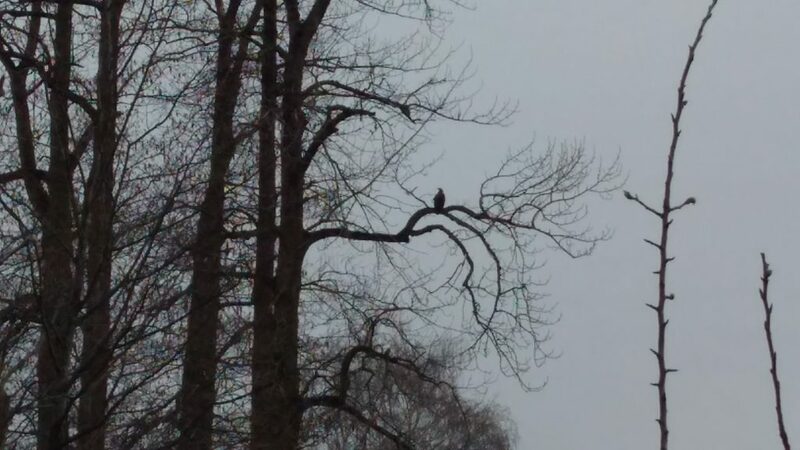 It was perched high up, far enough from my place on the ground that I wasn’t able to make out the true color of its head against the grey and misty sky. It was so large, so tall, impressive there in that grim still-winter tree. It seemed to be some huge, mysterious bird, neither this nor that. I stood and watched for some time, trying to make it out, until it took flight again, swooping low behind the barn up the hill. It must have found some prey there in the grass. After I had come in and taken off my muddy shoes and walked through the house to hang my coat, I saw it fly into the biggest cottonwood at the entrance to our drive. Through the dining room window, I watched as it began to peck and tear at something hidden between its feet on the branch. A group of starlings and crows gathered in the branches, one flying in, another flying off, slightly below and to the side. They eagerly caught particles of what it ate as it pulled off morsels with abandon and gobbled them, head thrown slightly back. Through the binoculars I grabbed from the kitchen drawer, I could see the feathers on its great head were wet and ruffled, plastered to its head leaving bare patches between the rows. The feathers were not yet white but, from the shape of that head, the glimpse of an eye, they clearly would become so. Its forehead sloped into the large hooked beak, its body substantial and heavy, balanced on strong legs. It must, in fact, be the offspring of the pair of eagles from the nest behind the house on top of the big hill to the north, maybe from two or three years past, coming back to find a territory of its own. Maybe it has been the one to claim the huge nest where it was hatched, reinforcing it with twigs and mosses as have his ancestors, year after year, maintaining its ancient continuity. I’ll watch as I go about my business day after day and see if it returns to the big cottonwood, itself to watch and wait with the patience of nature’s flow.